The Walt Disney World Monorail System is a public transit monorail system in operation at the Walt Disney World Resort in Bay Lake, Florida, near Orlando. The Walt Disney World Resort currently operates twelve Mark VI monorail trains on three lines of service. The monorail system opened in 1971 with two routes (Magic Kingdom: Resort and Express) and with Mark IV monorail trains. It was expanded to three lines (Magic Kingdom: Resort and Express, plus Epcot) in 1982, and the rolling stock was updated to Mark VI trains in 1989. As of 2016[update], the system is one of the most heavily used monorail systems in the world, with over 150,000 daily riders. It is surpassed by the Tokyo Monorail in Tokyo, Japan, which has over 300,000 daily riders; and by the monorail system run by Chongqing Rail Transit in Chongqing, China, which has over 900,000 daily riders on Line 2 and Line 3 combined. The Walt Disney World Monorail spans 14.7 miles (23.7 km), with around 50 million Disney guests traveling on the monorail each year. The system opened with the rest of the Walt Disney World Resort on October 1, 1971. It initially featured four stations: the Transportation and Ticket Center, Disney's Polynesian Resort, the Magic Kingdom and Disney's Contemporary Resort. The Epcot line and station were added during that park's construction, opening on October 1, 1982. The most recent addition was the Grand Floridian station, which was opened in 1988 along with the resort hotel. Express: Express service between the Magic Kingdom and the Transportation and Ticket Center (TTC). Express service runs on the outer loop of this route and travels counter-clockwise. Resort: Round-trip local service on the inner loop, running clockwise, making stops in order at the Magic Kingdom, Disney's Contemporary Resort, the Transportation and Ticket Center, Disney's Polynesian Village Resort, and Disney's Grand Floridian Resort and Spa. Epcot: Service between the Transportation and Ticket Center and Epcot. Service on this route is a single beam running clockwise on the loop. A spur track at Magic Kingdom station connects the Express and Resort lines to the maintenance shop. Another spur connects the Epcot and Express lines and is located northeast of the Transportation and Ticket Center. The monorail beams, which are made of concrete with a special polystyrene core to lighten their weight, came by train from the state of Washington. The original control system served from 1989 with the introduction of Mark VI Blue until June 2007 when the final train, Blue, was converted to the new LMCU2 system. The trains in use since 1989 are each 203 ft 6 in (62.03 m) long (consisting of six cars) and can carry 360 passengers. The trains are driven by eight 113 hp (84 kW) motors which are powered by a 600-volt electrical system running through a busbar mounted on each side of the concrete beam. Each train also has seven inverters on board that convert the 600 V DC to 230 V AC for use by the air conditioners and air compressor, and additionally has a battery-backed 37 V DC low-voltage supply that provides power for the train's electronics. The trains are also equipped with a towing knuckle at each end to allow it to be pushed or pulled by a special diesel-powered tractor if need be. Maximum speed during normal operations is 40 mph (64 km/h), with several speed zones throughout the system with limits ranging from 15 to 40 mph (24 to 64 km/h). These speed limits are strictly enforced by the train's computer and cannot be overridden without the operator engaging a special lockout. Attempting to drive the train too quickly in a given speed zone will result in an "overspeed stop." Train spacing is maintained by the Moving Blocklight System (MBS), also known as the MAPO system (for "Mary Poppins," U.S. Patent 3,973,746), which establishes a number of "holdpoints" throughout the system. At any given time, there must be at least two holdpoints between a given train and the train ahead of it. When the train detects that there are fewer than two holdpoints between itself and the preceding train, the emergency brakes are immediately applied and cannot be released until sufficient spacing becomes available or the operator overrides the system. Failure to maintain adequate spacing is known as an "overrun," and is treated as an extremely serious offense. Since the implementation of automation, platform attendants use a control panel located on each station platform to operate the monorail. Starting June 22, 2014, the monorail began operating on a different timetable in order to accommodate work to automate the system. Disney stated that the system would provide a more efficient service with enhanced safety, as well as more frequent dispatch of the trains, faster switching times, and monorail arrival information. Pilots are still seated in the front cab, but only supervise the monorail in case of an emergency. Platform attendants operate a control panel to dispatch and operate the monorail system. Monorail Peach on October 22, 2011 outside Disney's Polynesian Resort. Each train is identified by a colored stripe, and given a name according to that color. The complete list of colors used is below. To help visually identify Green from Lime, Pink from Coral and Blue from Teal, the Lime, Teal, and Coral stripes have a white delta painted on each car. Originally, Monorail Lime's deltas (and those of the older Mark IV Lime) were painted a dark blue in homage to the original Walt Disney World monorail cast's costume colors (lime and blue), but the colors were changed when the entire monorail fleet was repainted in the early 2000s. In mid December 2018, Monorail Lime’s white delta was repainted to the original dark blue scheme. In November 2009, Disney put Monorail Teal into service. Monorail Teal was built using the undamaged portions of the two trains involved in the July 5, 2009 crash. The colors of the two trains involved, Pink and Purple, were retired from service. The twelfth train, Peach, was placed into service on October 7, 2011 to restore the resort's fleet back to twelve trains. It was assembled using the undamaged center cars from the Purple train, but with new end cabs replacing the damaged sections from the Pink and Purple trains. In March 2010, Disney debuted Monorail Coral in TRON livery on the Epcot line as part of a marketing plan for Tron: Legacy. 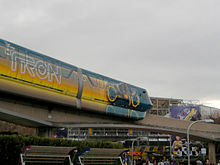 Since the Tron paint scheme in 2010, there have been several other monorail wraps. On March 31, 2012, Monorail Red was converted into a special scheme commemorating the release of The Avengers, similar to the previous promotion for Tron: Legacy. The monorail runs on the Magic Kingdom line and sometimes on the Resort line as the Epcot line loops through the park itself, since Disney is not able to feature specified Marvel characters inside its Florida parks due to Marvel Entertainment's license agreement with Universal Parks & Resorts that was in place prior to the purchase of Marvel in 2009. In March 2013, Monorail Black was given a similar conversion to promote the release of Iron Man 3. In April 2013, Monorail Teal was converted into a special scheme commemorating the release of Monsters University. In November 2015, Monorail Black was decorated in Star Wars designs commemorating the release of Star Wars: Episode VII - The Force Awakens. In February 2016, Monorail Orange was decorated in Zootopia designs and was named the Zootopia Monorail System to reflect the Zootopia Transit Authority, commemorating the release of Zootopia. In June 2018, Monorail Orange was decorated in Incredibles designs to promote the release of Incredibles 2. An example of the former Lime Delta. These colors were retired after the July 2009 incident. There is seating for up to four guests in the front cab of the train with the pilot who manually drives each train. These were offered on a first-come, first-served basis, and a pilot gave out "co-pilot licenses" at the end of the journey. Front cab riding was suspended permanently after the July 5, 2009 crash. The monorail system uses a set of pre-recorded announcements to instruct and entertain passengers. Prior to departure when the pilot closes the doors, an announcement asks guests to "Please stand clear of the doors. Por favor manténganse alejado de las puertas." One of the most well-known phrases within the resort, it was recorded by Jack Wagner, who was known as "the Voice of Disneyland." In 1988 following the construction of the Grand Floridian Resort stop, Kevin Miles replaced Jack Wagner as the voiceover. Wagner can still be heard today as the "Please stand clear of the doors ..." phrase remains with his voice, partly because it is installed on a separate system. Miles worked in Epcot as part of the 'Voices of Liberty' in the American Adventure pavilion at World Showcase. Sometime before 1998, Disney employee Matt Hanson replaced Kevin Miles, and in 2004 Hanson was replaced by Joe Hursh. Hanson is still with the Walt Disney Company. During the system's early years, the trains featured Wagner's narration of the sights and scenery along the way, as well as information on special events, the resort, and the monorail system itself. On April 13, 2012 at around 5:00 EST, Disney activated a newer version of the spiel on the monorails that features Tom Kane as its new narrator. Monorail Shop ("Shop" for short) is Disney's monorail maintenance facility located a short distance northeast of the Magic Kingdom, and provides space for up to ten of the twelve Mark VI trains on its upper level (the bottom level houses the four steam locomotives and trains of the Walt Disney World Railroad in the Magic Kingdom on its west side, and a road vehicle maintenance facility on the east side). On any given night, two monorail trains are parked at various stations on the system. On nights where the temperature drops below freezing, the trains will be parked inside the Contemporary Resort; but in practice, trains can be left in any station (even on the express side of a resort station). No train will ever be left outside two nights in a row because routine maintenance is performed nightly. The Monorail Shop also has a painting room located on Beam 10 that is elevated 25 feet (7.6 m) off the ground and has a lift mounted on the wall for the painters. It takes three weeks to paint a monorail train. To access the wheels and underside of the monorail, a portion of Beam 1 inside Shop is removable, primarily used to change load tires. The Green work tractor towing Monorail Green on the maintenance access beam. The diesel-powered "work tractors" are the tow trucks of the system, and can tow a train to Monorail Shop, located around the bend from Space Mountain. Monorail Operations at the Walt Disney World resort has three separate tractors (Red, tagged '1', Blue, tagged '2', and Green, tagged '3') that allow for the simultaneous towing of three different monorails. In the event of a power failure on one of the monorail lines, the tractors are still operational, as they are powered by on-board diesel engines. When not in use, two of the work tractors will usually be parked at the shed while the third is parked on a small 62' maintenance spur just outside of the Transportation and Ticket Center along the Epcot beam to allow for faster access to any issues on that part of the system. Safe train spacing is maintained via a moving blocklight system, referred to as MAPO, installed in the cab of each train. MAPO appears in the top center of the pilot's console and looks similar to a horizontal stop light. There are three lights—green, amber, and red—and a push-button labeled "Override". The term "MAPO" itself comes directly from Walt Disney, who formed a new company to deal with Disneyland's transportation system directly from the profits made by Mary Poppins. Each monorail beam is divided into blocks based upon pylon numbering. The currently illuminated MAPO color indicates how far ahead the leading train is currently located. A green MAPO shows that the leading train is 3 or more blocks ahead, amber means 2 blocks ahead, and red indicates that the next train is in the very next block. A block is roughly between 500 and 1000 feet (about 150 and 300 m) long, although this varies. The start of each block is called a "hold point", as pilots may need to hold their trains at that location until the train ahead moves away. Guests riding in the front cab of a monorail can identify hold points by the yellow reflective tape around a pylon's number and by two yellow reflectors attached to the top outside edges of the monorail beam at that pylon. For safety, trains must be kept at least two blocks apart during normal operation. A red MAPO indicates that train spacing has become unsafe. When a red MAPO occurs, the train's on-board computer locks out the pilot's propulsion control and applies emergency brakes. The pilot cannot resume control of the train until either the MAPO clears or the pilot presses and holds the MAPO override button. It is the pilot's responsibility to avoid a red MAPO during normal operation. When the MAPO switches from green to amber, this indicates that the monorail is approaching the train ahead. The pilot must stop the train before crossing into the next block of beam way and hence before the MAPO switches to red. Should a pilot cross the hold point and receive a red MAPO, this counts as a safety demerit against the pilot. If a pilot accumulates three demerits on his/her record within a two-year period, then he/she will be transferred out of the monorails department and into a different role at Walt Disney World. Safety tests are performed daily to ensure that the MAPO system is working properly on each train. At the direction of the monorail station conducting the test, each train will intentionally overrun a hold point to verify that a red MAPO occurs and that the emergency brakes activate. Pilots perform tests in forward and reverse when bringing a train onto the system for the first time that day. The indications are called into Monorail Central with the emergency brake pressures. A red MAPO will also occur when the pilot approaches a section of un-powered beam, a spur line, or a switch beam thrown in the direction of a spur line. Pilots must engage the MAPO override when moving trains through a switch to the spur line. Red MAPOs occurring due to safety tests, switching, or beam power loss do not count as demerits against the pilot. If a train is stopped at a station platform or at the work platform along the Epcot beam, guests can exit the train onto the platform. Exiting a train is possible even when the doors of the train cars are closed. The large rectangular window in the middle of each car is an emergency exit and can be removed from the interior of the car. A cast member outside the car can also manually open the rightmost door panel of the car by releasing the air pressure holding that panel closed. The air pressure release is a handle beneath the rectangular center window that is similar in appearance to a car door handle. If a train is stopped on an open beam, then guests evacuate through emergency exits located in the roof of the train. Guests open roof hatches by first removing decorative plastic from the ceiling above a bulkhead footstool and then by lifting open a hinged hatch that will flip across the bulkhead dividing two train cars. Guests evacuate to the roof by climbing through the open hatch onto the top of the train. The bulkheads separating cars are designed as firewalls that will contain a fire within a car to just that car. The open hatch allows guests in the affected car to transfer to an adjacent car where they can safely wait for evacuation by fire response crews. If the emergency affects the entire train, then guests are evacuated to the surface of the beam. Guests again open the emergency roof hatches, but do not simply move to the adjacent car. Instead, they use a small handrail present along the top of each train car to move all the way to the front of the train. The train's pilot can attach a knotted rope to both the top and the base of the windscreen, and guests use the rope to shimmy down the windscreen to the surface of the beam. They finally start walking along the beam away from the train. Reedy Creek Emergency Services provides fire response and rescue for the Walt Disney World Monorail System and maintains an all-wheel-drive fire truck specially designed for monorail rescue. Platform Controls at Magic Kingdom Station. The Express station at the Transportation and Ticket Center, and both stations at the Magic Kingdom have remotely opened or automated gates that bar riders from approaching the guideway (and, thus, any approaching or departing train) until the operators have determined that it is safe to allow people to board the train. The cast member at the station gives the riders instructions on how to board. The other stations have manually operated gates to serve this function. All platforms are ADA-accessible. Because the train level is higher than the platform level, a portable ramp must be used to load and unload disabled guests at all stations. For many years, the Contemporary Resort station did not have ADA access, but an elevator has since been added to the platform. Several accidents and injuries have occurred on the monorails since Walt Disney World opened, as well as one death. On July 5, 2009, a driver was killed after the Pink and Purple monorails collided on the Epcot line at the Transportation and ticket Center. This was the only deadly incident on the Walt Disney World Monorail System in its history. 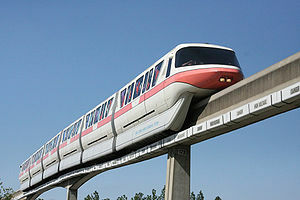 ^ a b "Walt Disney World Monorail System". Archived from the original on June 15, 2012. ^ The Monorail Society. "Walt Disney World". Archived from the original on May 19, 2007. Retrieved June 23, 2007. ^ a b c Monorail Express. "Facts". Archived from the original on May 20, 2007. Retrieved June 13, 2007. ^ a b c d Garcia, Jason (October 15, 2009). "Walt Disney World to bring new monorail train into service". Orlando Sentinel. Archived from the original on October 17, 2009. Retrieved October 15, 2009. ^ "UPDATE: New monorail fleet in the works? Disney World denies rumors". palmbeachpost. Retrieved June 29, 2018. ^ "Webster: D.C. Metro should be more like Disney World monorail". Orlando Sentinel. Archived from the original on July 30, 2016. Retrieved September 14, 2016. ^ "Tokyo Monorail Co., Ltd. – Company Profile". Tokyo Monorail Co., Ltd. Archived from the original on September 19, 2016. Retrieved September 7, 2016. ^ "重庆轨道3号线成世界上最繁忙的单轨线". 国际在线. Archived from the original on December 5, 2014. Retrieved September 7, 2016. ^ Robinson, Cindy; Jefferson, Jon; Wooten, Les (2006). Modern Marvels - Walt Disney World (History Channel) (DVD). New York: A&E Television Networks. ASIN B000CS461O. ISBN 9780767087896. OCLC 64282449. ^ a b c d e NYCSubway.org. "Walt Disney World Monorail". Retrieved June 13, 2007. ^ Neal, Julie; Mike Neal (April 15, 2007). The Complete Guide to Walt Disney World (1st ed.). Coconut Press. ISBN 978-0-9709596-4-5. ^ Higgins, Chris (July 10, 2009). "Technical Details of the Disney Monorail". Mental Floss. Archived from the original on May 19, 2018. Retrieved March 6, 2019. ^ "Monorail system to operate on new timetable to accommodate automation work". wdwmagic.com. July 13, 2014. Archived from the original on November 30, 2014. Retrieved November 30, 2014. ^ Diffendal, Jason (December 15, 2018). "PHOTOS: Monorail Lime Regains Blue Delta". WDW News Today. Archived from the original on January 27, 2019. Retrieved January 27, 2019. ^ a b Garcia, Jason (November 5, 2009). "'New' monorail train goes into service at Disney World". Sentinel Teal Service. Archived from the original on November 8, 2009. Retrieved November 5, 2009. ^ Garcia, Jason (August 12, 2011). "Disney new monorail: Disney World to add new monorail train". Orlando Sentinel. Orlando, Fla.: Tribune Company. ISSN 0744-6055. Archived from the original on October 5, 2012. Retrieved September 15, 2011. ^ a b Pedersen, Robert (October 7, 2011). "Monorail Peach Added Into Service at Walt Disney World". TouringPlans.com. Archived from the original on October 12, 2011. Retrieved June 15, 2017. ^ "Photos of monorail TRON Legacy on the Epcot beam". WDWMagic. March 19, 2010. Archived from the original on October 16, 2015. Retrieved February 3, 2019. ^ Brigante, Ricky (March 31, 2012). "First Look: The Avengers monorail debuts at Walt Disney World on the Magic Kingdom express line". Inside the Magic. Archived from the original on April 1, 2012. Retrieved February 3, 2019. ^ "Iron Man 3 monorail to debut soon at Walt Disney World". Attractions Magazine. March 23, 2013. Archived from the original on September 11, 2014. Retrieved February 3, 2019. ^ Fickley-Baker, Jennifer (April 23, 2013). "Monstrous 'Monsters University' Monorail Pulls Into Walt Disney World Resort". Disney Parks Blog. Archived from the original on January 8, 2018. Retrieved February 3, 2019. ^ Fox, Steve (November 23, 2015). "Star Wars: The Force Awakens monorail debuts at Walt Disney World". Inside the Magic. Archived from the original on December 1, 2015. Retrieved February 3, 2019. ^ "PHOTOS - Zootopia takes to the monorail beam with new promo wrap". WDWMagic. February 8, 2016. Archived from the original on January 3, 2018. Retrieved February 3, 2019. ^ Sposato, Sean (June 12, 2018). "VIDEO: The Incredibles take over the Walt Disney World Monorail system as part of Incredible Summer at Walt Disney World Resort". Inside the Magic. Archived from the original on February 3, 2019. Retrieved February 3, 2019. ^ "Joe Hursh". Joe Hursh. Archived from the original on July 4, 2012. Retrieved October 19, 2012. ^ a b Mongello, Lou (April 21, 2004). "Please stand clear of the doors... Por favor mantenganse alejado de las puertas..." Ask Lou. Disney World Trivia.com. Archived from the original on May 6, 2007. Retrieved October 5, 2007. ^ "Disney monorail voice change: Walt Disney World changes narrator on monorail". OrlandoSentinel.com. June 28, 2012. Archived from the original on August 14, 2012. Retrieved October 19, 2012. ^ "Hidden Mickeys". Hidden Mickeys.org. Retrieved June 21, 2007. ^ "Disney World Monorail". Archived from the original on August 25, 2007. Retrieved September 20, 2007. ^ The Reedy Creek Fire Fighters Association Local 2117. "Our Apparatus". Archived from the original on July 5, 2008. Retrieved June 23, 2007. ^ "Transportation News & Information". WDWMagic. Archived from the original on June 24, 2007. Retrieved June 21, 2007. ^ "Monorail Crash At Disney World Leaves Employee Dead". Huffington Post. Archived from the original on April 2, 2015. Retrieved September 25, 2014. ^ Geiger, Brian (December 1, 1979). "Mark IV Monorail, Community Transportation Services". CTS, division of Buena Vista Distribution Co. Inc., a subsidiary of Walt Disney Productions. Archived from the original on March 6, 2012. Retrieved August 24, 2013. 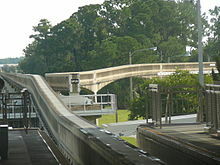 Wikimedia Commons has media related to Walt Disney World Monorail System. "Monorail Express". monorailexpress.com. Retrieved August 2, 2006. "Disney World Monorail". NYCSubway.org. Retrieved August 2, 2006. "Disney's Monorail". WDWHistory.com. Retrieved August 2, 2006. "WDW Monorail via BFC". bigfloridacountry.com. Retrieved August 2, 2006. This page was last edited on 18 March 2019, at 04:37 (UTC).